The ink was barely dry on their $3.5 billion dollar acquisition of troubled Japanese giant Sharp Corp., when Foxconn’s CEO Terry Gou was forced to admit that overall orders for goods produced by the Taiwanese OEM manufacturer are dropping. Gou was essentially pressed to make the admission by China’s Premier Li Keqiang on Tuesday. Foxconn is the better known subsidiary of Hon Hai Precision Industry Co. which is best known as the top supplier of manufacturing services to Apple, Inc. – building Apple’s top products, such as iPhone, iPod, iPad, etc. 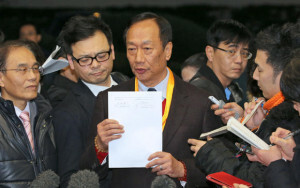 Flamboyant Foxconn CEO Terry Gou, garnered a tremendous amount of publicity recently as he pursued the stumbling Sharp – a company he wished to acquire to gain access to what he believed was their tremendous technology assets. Gou had been, in different ways, pursuing Sharp for a number of years – even partnering with them in one of their large LCD manufacturing operations. But the two parties had a bit of a love/hate relationship, as Sharp had rebuffed investment efforts from Gou in the past. Then, Sharp’s business hit the wall and Gou reentered the scene. You Won It, Now What? Now firmly in possession of the sprawling, struggling Sharp, Foxconn is facing reality. Apple, its largest customer, has seen a significant softening of several of its products – most notably, the iPhone. Apple is Foxconn’s largest customer globally – some reports say Apple is more than 50% of Foxconn’s total revenues. 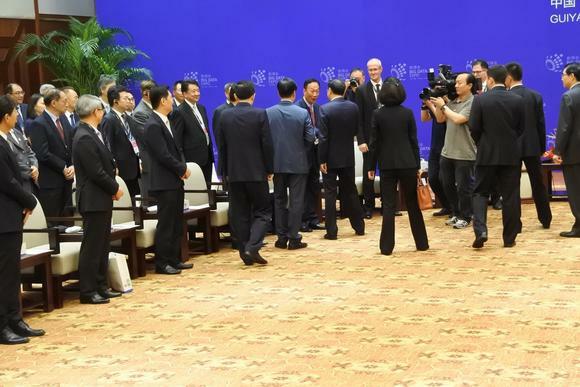 This week, Gou found himself at a big data conference in Guiyang, China – an event that also featured the Chinese Premier and an exchange took place that Gou would likely have preferred to avoid. In a meeting with the Premier, Gou updated Li on Foxconn’s business plans. Apple is a big, and sometimes controversial, topic in China, and the premier wasted no time in getting right to it…asking Gou point blank whether his orders were flat or down this year. Reports from the event say that Gou evaded the premier’s question – saying he would report that info to the Li in private. He quickly moved on, telling the Chinese Premier that Foxconn “went through some adjustments” in the first quarter, but then received some unexpected orders from startups in April and his workers were “clocking in more overtime” in May. “The overall trend [for orders] is on the decline,” Gou finally admitted. If timing in life is everything, then the timing of the Foxconn acquisition of Sharp couldn’t have been worse. A prime motivating factor in Gou’s desire to purchase Sharp, was to ramp up in-house production capacity of LCD displays – largely for Apple products. Over the last few years, Foxconn has struggled to meet demand as many of Apple’s lines were growing rapidly…then. Now…Apple has seen significant softening in multiple lines, recently reporting its first drop in iPhone shipments, but also softening in iPad and Mac sales. 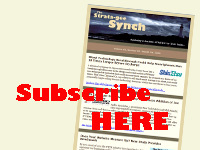 In a way, it’s a bit of an analog of what many believe is the singular decision that killed Sharp. In 2009 Sharp spent a whopping $5 billion to build a HUGE, next-generation LCD manufacturing plant, right on the cusp of industry saturation and decline for the technology. Between new aggressive competitors out of Korea and China killing panel pricing…and the global slackening of demand for panels…the fuse was lit for the explosion of Sharp. Is the fuse lit for the explosion of Foxconn?